I just returned from a week of (attempted) hiking on wet, icy trails in the Olympics (western Washington State). Day after day, I made decisions to turn around because of threatening weather, dicey footing, or overly curious male mountain goats. Yet it really brought home the message of safety on the trail, after a long stretch of complacency during recent months of fair weather hiking. So this month’s newsletter will share information on just that: staying warm, dry and safe on the trail, including 4 new gear reviews, how to make better decisions in the outdoors, two new low cost ways to get high quality used gear and outdoor clothing into your hands, a chance to enter a Hiking For Her giveaway for free JunoActive plus size athletic clothing. Although Hiking For Her strives to review at least one new product for you each month, in October four interesting outdoor products made their way into the queue. After thoroughly testing them, I can say that all of them will enhance your safety and comfort on your next hike. To be fair, I also call out any drawbacks I found, which you can read in the links below. I was smacked in the face with the fact that while I thought I knew myself quite well, I was super reluctant to make the right decision in the face of looming threats during my recent ill fated hiking trip. I’m sure you’ve been there: “But I only have a few days to hike here!” Or this one: “It doesn’t look so bad” (while staring at 100 yards of icy, steep trail). So I had to laugh out loud when I got back to civilization and immediately found a NOLS article in my inbox which explains how to avoid falling into habitual traps you set for yourself. Punch line: Know thyself, hiker, and make safer decisions outdoors. Big news: REI and Patagonia are now selling their used gear on line. Seems like a logical way to re-purpose clothing and gear returned for sizing, color and fit issues – and it’s going to save you money. Bonus: With Patagonia, you can trade in your own gear to build up your hiking budget! Speaking of low cost (as in free!) options to get yourself on the trail in safety and comfort, how about a chance to win a three piece plus size outfit of athletic clothing for the trail? Enter for yourself, or to gift to a trail buddy if you win! JunoActive has generously agreed to send one lucky winner a fleece jacket, stretch top, and leggings. It only takes an email to enter. Be sure to sign up for their newsletter when you’re checking out the details: it saves you money, and highlights their newest products. If you haven’t signed up yet for Hiking For Her’s weekly emails, you’re missing more giveaways. 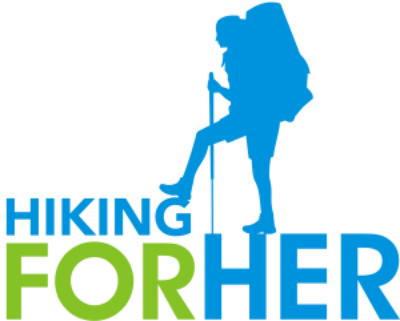 For example, one lucky winner is now reading a free copy of HFH’s Best Tips For Women Day Hikers (an October giveaway). In November 2017, there are at least 2 giveaways coming up, with entry deadlines which expire before this monthly newsletter has a chance to land in your inbox. So if you’re interested in a weekly dose of giveaways, time sensitive discounts and coupons, hiking resources and useful trail news that doesn't make it into this newsletter, sign up now! It’s a fast, easy way to keep the flow of all things hiking coming your way. Great Old Broads For Wilderness (which welcomes men as well), founded in 1989, works to preserve and protect our steadily shrinking wilderness throughout the United States. How can you help? Bid on some unique and/or practical items from October 29 to November 12, 2017 at the Great Old Broads For Wilderness annual fund raising online auction. Your auction dollars will help them achieve their national grassroots mission of keeping public lands safe and usable for the next generation. But don’t wait until October 29th. You can browse your options right now! It’s tough to know exactly how much to spend, and on what, when you’re starting out as a hiker. My inbox has a lot of folks asking these questions, which prompted me to write a gear guide for them. I mentioned it in last month's newsletter, but you may have missed it. My hope is that by naming names and prices, it will help you sort out any gear and clothing dilemmas that may prevent you from hiking. You are a valued member of our hiking community, whether or not you realize it. So many females are encouraged to sit still, be quiet, stay inside, not get dirty, and so many other messages to play small – but you? You realize how much fun it is to move your body on a hiking trail, gathering dirt on your boots, fresh air into your lungs, and peaceful vistas to nourish your heart throughout the coming days and years. Out of space, but never out of news! Lots more for you next month. I'd love to hear from you, so please share your hiking triumphs, frustrations, challenges and questions. I personally answer every email I receive (way more fun than fending off a goat with my trekking pole, for sure). May you be your best hiking self, today and every day.